A fantastic evening was had by all at our 13th Annual Presentation Evening on Saturday, many thanks to our guest of the evening Stevie Baxter (The Sporting Pursuit) who did a tremendous job keeping the night running smoothly as our compere. Also thanks goes to all our coaches for their continued support, players, parents and all those involved in supporting the evening. Photos of the evening are now available, thank you to David Young for coming along to cover the event. U7, U9 and U11 sides not involved with competitive football, were awarded medals for their efforts while the older sides were presented with awards ranging from a Clubwoman Award to Players’ Player of the Year. Well done to our players selected for National Camps next month. 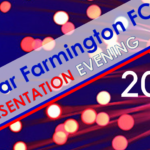 Farmington U13s Vivian Kerr and Brodie Greenwood along with Farmington Falcons U15s Alex Glennie have been selected to attend Scotland U14 Training Camp, taking place between June 1st-3rd at Tulliallan Police College. 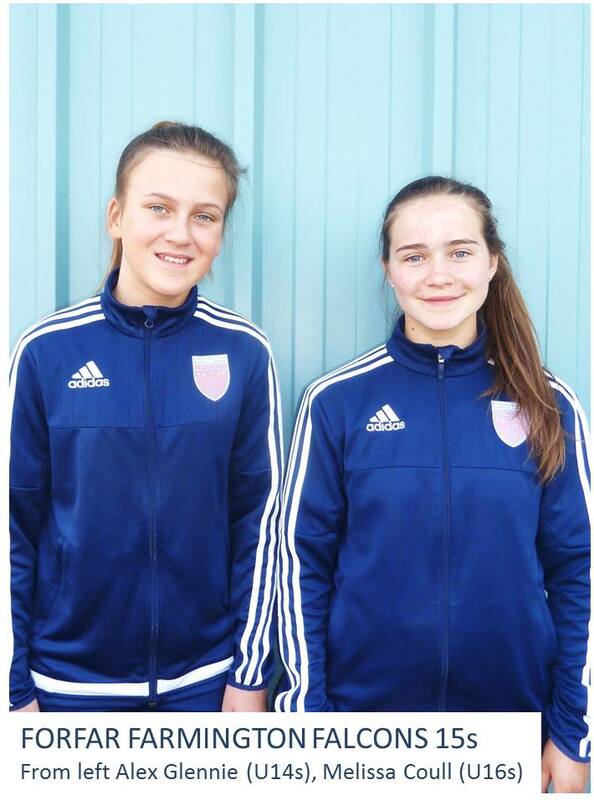 While Melissa Coull & Kasey McCabe (not pictured) have been selected for the Scotland U16s Training Camp along with Farmington 17s players Katie White and Beth Mowatt. U16s Camp taking place at University of St Andrews from June 22nd-23rd. The group of girls in our U17 side faced a real challenge in their Scottish Cup quarter final when they hosted Rangers to Station Park. A beautiful end of summer Angus day welcomed our friends from Glasgow and it provided the backdrop for a keenly contested cup-tie that saw Forfar eventually edging through on penalties. The season so far for our U17s has been a challenging one what with a number of players out with injuries at different times of the year and the loss of some players however the team-spirit and togetherness of this side is something that always seems to help them overcome the hurdles that they face. Sunday’s performance and result is further evidence of this. Rangers showed what a good passing side they are from the beginning of the game. Forfar’s decision to sit a little deeper allowed Rangers to play a passing game from the back however they found it difficult to break through and a get any real efforts on the Forfar goal. They kept plugging away though and did create a real chance when a through ball to one of their strikers looked as though a goal was a certainty. Just as the ball was fired goalwards it was blocked by an astroturf burning sliding challenge by Forfar’s Aimee Robertson; the kind of commitment that ran through the whole Forfar team. Forfar were very much in it and pressed on the counter-attack at every opportunity however the sides went in at half-time at 0-0. The second half saw more of Forfar as an attacking force and it was indeed Forfar who took the lead 10 minutes in when they broke the deadlock with a well-taken goal. Philippa McCallum fired in a perfectly placed corner right on top of the six yard box and it was met beautifully by the head of Katie White whose header powered into the Rangers net. Rangers pressed forward for an equaliser but their efforts were kept at bay by the hard working Forfar midfield and their solid defence. Forfar carved out a number of chances but they couldn’t get that decisive second goal. Just as it looked as though Forfar were going to see out the match Rangers drew level. A mis-hit shot looked as though the save was a straightforward matter for our keeper Suzie Adam however it somehow squirmed through her hands into the net. The Forfar team showed their spirit as they, and especially Suzie, responded to this set-back and they should really have wrapped it up with minutes to go however the Rangers keeper denied Steffi Simpson with a couple of very good saves. With the game level after 80 minutes, extra-time was to follow. 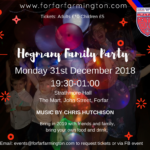 It was clear that Forfar’s confidence had grown as the game progressed and it was them who went ahead again when Philippa McCallum met a through ball from Katie White to hit a beautiful left-foot volley over the head of the Rangers’ keeper into the net. It looked as though the tie was Forfar’s however Rangers drew level at the death when their left winger’s shot came off the post and fell to their striker who poked the ball home for the equaliser to the joy of the travelling support. Forfar again had chances to win the tie but the final whistle came and penalties had to be faced! Forfar went first and Philippa McCallum, Kacey McCabe and Katie White fired excellent penalties home to put their side 3-2 up. Suzie Adam then gave her side the advantage with a great save. 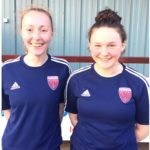 Aimee Robertson pressed that advantage home with a great strike and Caitlin Mitchell calmly fired home for a 5-3 victory on penalties. This was a pulsating cup-tie that had all spectators on the edge of their seats. We wish to say thank you to our visitors from Glasgow for the sporting nature of the day and we wish them every success for the remainder of their season. On to the semis finals for the girls from Farmington and very well done on a great performance. 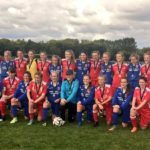 It was with great excitement that a convoy of cars carrying the girls from Forfar Farmington U17s made the relatively short journey up to Westview Park in Kirriemuir for the East Region League Cup Final against Aberdeen. This season has been an eventful one for our U17s and although they have contended with a number of injuries they have shown the resilience and drive to make it to today’s final. An early season 1-1 draw against Aberdeen let our girls know that they were up against a very good side however belief was strong in the Forfar camp despite having to field an outfield player in goal. The match kicked off in perfect conditions and the early pressure came from the girls from the Granite City. Forfar defended resolutely and looked to utilise the pace of Steffi Simson as they hit on the break. Aberdeen missed a glorious chance when their centre forward blasted wide from close range. Forfar then nearly took the lead when a great run by Neve Guthrie ended with her slipping her shot just passed the post. Forfar then had a ‘goal’ disallowed when Kacey McCabe fired the ball home at the far post however the flag was up for offside. Aberdeen took the lead not long after this when a through ball saw one of their players deftly slip the ball into the net. The blow of going a goal behind was doubled a minute later when a speculative drive from long range flew high into the net. Forfar competed well to try to get back into the game but they fell a further goal behind when an Aberdeen player fired home from the edge of the box to put her side 3-0 up at half-time. Forfar continued to work hard for each other and they stood up very well to the driving play of their opponents. They fell a further goal behind when they conceded a penalty but it was Philippa McCallum who bagged the goal of the day when she fired in a free kick into the nearside top corner to bag a consolation goal for her team. Although disappointed with the result the coaches were very proud of their young team who did exceedingly well to make the final. Congratulations to Aberdeen on a well-deserved victory and for the manner in which they won the match. 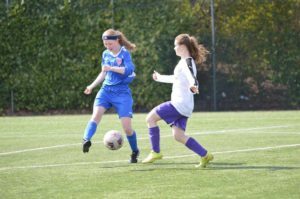 Philippa McCallum believes Forfar Farmington’s U17 squad can clinch the East Region League Cup tomorrow if they give it their all against Aberdeen. The girls will face the Dons at Westview Park in Kirriemuir at 1pm and will look to lift the trophy after winning the U15 version last season. McCallum reckons her team mates are looking forward to the final and belief in the squad is high. The side are currently second in the East Region league, six points behind tomorrow’s opponents with two games in hand and McCallum is delighted with the progress made so far this year. 2017 has been a good year for the 14 year old, having made her Premier League debut, named in Scotland U16 & CYP squads, winning the Player of the Tournament in the CYP Rosebowl tournament. McCallum holds the record for youngest player to make her senior debut for Farmington in the Premier League, making her bow against Jeanfield Swifts in March at 14 years, 5 months and 24 days, and the youngster hopes she can add to her tally in the future. 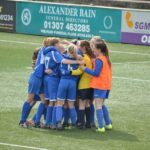 In what turned out to be a pulsating and hugely competitive match Forfar Farmington U17’s scored a late extra-time winner against a tough Hibernian side to book their place in the semi-finals of the League Cup. It was with great anticipation that the coaches and players from Forfar Farmington U17s prepared for their League Cup quarter final tie. 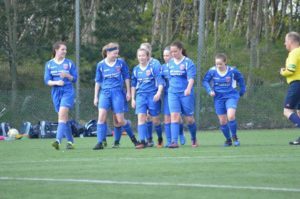 The draw had paired them with what might be described as a plum tie against the very powerful Hibernian U17 and after having suffered a pre-season friendly defeat to them it was a further chance for our girls to show the progress they have made since that match. 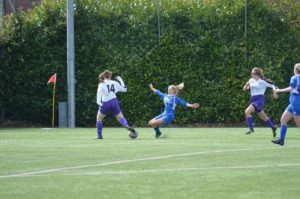 The girls from Edinburgh showed their class and organisation as a team from the off as they looked to establish their pressing and passing game. 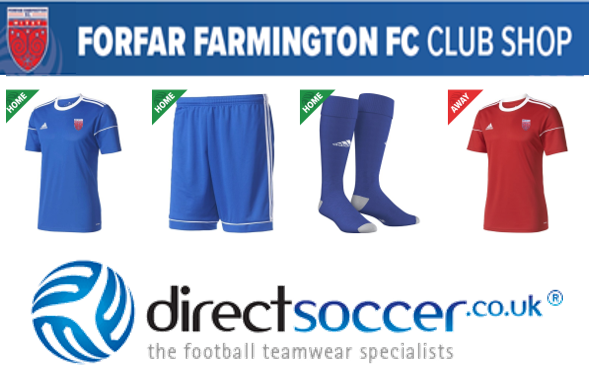 They gained the upper hand in the opening exchanges however Farmington were determined and competitive as they managed to keep any attempts on their goal restricted to long range efforts. Forfar almost snatched the lead form a corner however the break that resulted from that led to the opening goal for Hibs. A beautiful pass through the Forfar defence was picked up by a Hibs attacker who pushed through on goal before placing an angled shot into the far corner. Going behind seemed to galvanise Forfar and their efforts to get back in the game saw them carve out three excellent chances. 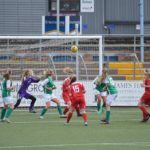 Through a combination of good defending by Hibs and Forfar’s misfortune saw our girls remain a goal down until the last minute of the first half. Phillipa McCallum swung in a vicious corner right on top of the Hibs keeper. The ball broke in the six yard box where Steffi Simpson was waiting to fire home a timely goal as her strike proved to be the last kick of the first half. The second half saw Hibs dominate the possession at times but without carving out any real chances. Forfar continued to defend very well and their counter-attacking saw them almost take the lead on a few occasions. As the game moved towards extra time you could see Forfar’s confidence growing as was their belief that they could achieve a notable victory against one of Scotland’s top sides. The match ended 1-1 after 90 minutes meaning extra-time awaited. Both sides had chances to nick the match however it was with 2 minutes to go in the second period of extra time that Forfar struck. The ball was played up to the left hand side of the Hibs half and then across the centre circle to where Kacey McCabe was waiting. Kacey decided to try her luck and she hit a speculative effort goalward from inside the centre circle. Her strike soared high in the air towards goal. The Hibs goalie seemed to misjudge its flight and in doing so she allowed it to bounce in front of and then over her into the empty net. An incredible finish to the match with an extraordinary goal sealing the victory for Forfar Farmington. This was a superb victory for the girls, after an excellent start to the season this result will build their confidence further. They now move on to the semi-final with increased belief that they can compete with anyone on the day. Huge thanks to all players and coaches from Hibs who contributed so much to an excellent cup-tie. We wish you all the best for the rest of your season. 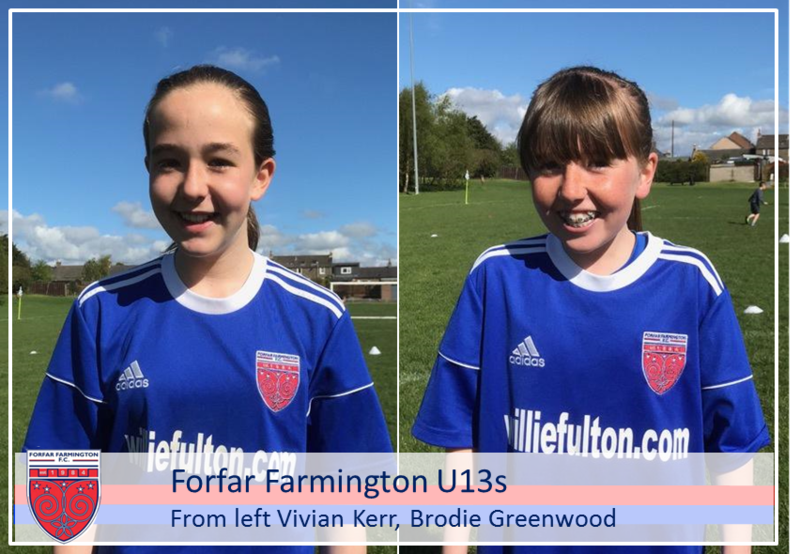 A spate of injuries that have all come at once looked as though it might adversely impact Forfar Farmington U17’s progress in the League Cup as they travelled through to Edinburgh to take on Boroughmuir Thistle in the first round of this year’s competition. These injuries meant that only ten girls were able to start the match, with no substitutes available. To make matters even harder for the girls was another injury during the game meant that they played most of the game with nine players and, on top of that, were the really difficult weather conditions! The horrendous wind meant that the isobars on the weather map were very tight together however not nearly as tight as the Forfar Farmington spirit as our girls fought against the odds to win a well-deserved victory. The girls kicked off with the wind at their backs. As the game progressed you could see that Forfar had put any idea of being a player down out of their minds as they worked very hard from front to back to build some consistent pressure on their opponents. The Boroughmuir defence was proving to be a competitive one and although they found themselves under pressure they worked hard to prevent any clear cut goal scoring chances. On a couple of occasions the Forfar defence, superbly marshalled by Katie White, was tested however they stopped any threats being made on their goal. Forfar found themselves even more up against it after 30 minutes when Eve Warden suffered an ankle injury. Although she attempted to continue playing it proved too uncomfortable so her withdrawal saw Forfar down to nine players. In spite of this Forfar took the leads with a beautiful goal from the left foot of Phillipa McCallum. With the keeper off her line Phillipa saw her chance from 25 yards to angle a real pearler of a strike high into the goal. This lead was a well-deserved and very welcome one in view of the fact that the girls would have to face their opponents with the wind at their backs in the second half. The second half saw the girls under a bit of pressure from Boroughmuir with long range efforts mainly being fired straight at our keeper. A couple of very dangerous corners were fired across the Forfar goal but on both occasions nothing was made of those excellent opportunities to draw level. Steffi Simpson’s pace saw her carve out a couple of chances but the Boroughmuir keeper stood strong against both. 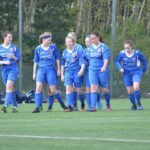 The final whistle eventually came and with it a place in the draw for the second round of the League Cup for our girls. A quite extraordinary victory in what was a really strong and committed team performance under challenging circumstances. Changes to the structure of the U17 league this year has brought teams from further north into the mix. A very welcome addition to the league is Westdykes Girls Club who hail from Westhill near Aberdeen. Our girls met their opponents in a pre-season friendly a couple of months back and managed to achieve a well-earned victory on the day and so it was with some confidence that they went into this match. Another victory did come their way however in what turned about to be quite a tricky match. The girls from Forfar kicked off and for the majority of the first half they had Westdykes pinned in their own half. The pressing and passing play that has clearly been in evidence so far this season from our girls saw them apply a great deal of pressure on the opposing defence. This pressure finally paid off when Erin Ross pounced on a loose ball in the middle of the park and then drove towards the goal; she outpaced the chasing defenders before calmly placing the ball in the net. Steffi Simpson put the team two up when she did really well to harass and then chase down the ball before outstripping the defenders again to fire past the Westdykes’ keeper. Steffi’s ability to win the ball and defend from the front in this way is a great asset to the team. Although Forfar had gone ahead and were doing the majority of the pressing you could see that the Westdyke team had a number of very good players. There were a couple of occasions where their number five broke clear down the right side of the pitch to then test AJ Meach in the Forfar goal. Their number three in the middle of defence was also playing very well as she marshalled her defence in the face of Forfar pressure. 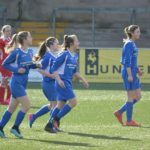 It was however Forfar who added another goal to their tally when Phillipa McCallum showed great technique to fire in a controlled left-footed strike into the bottom corner. Westdykes moved their number three into midfield for the second half and that tactical switch had an immediate impact on the game. A couple of through balls from her saw the high line of the Forfar defence put under pressure and the Westdykes’ number five through on goal. AJ Meach made some great stops but on the third occasion the same player managed to fire into the Forfar net. The Forfar girls seemed to lose a bit of shape for some of the second half however you could see their effort and commitment was not in question. Credit to Westdykes though who seemed to grow in confidence with their goal. Just when a second for Westdykes looked like it might be coming Forfar put their nerves at ease when Lucy Corbitt picked up the ball at the far post to fire home. Westdykes’ endeavours were rewarded with a second goal just before the final whistle. The U17 side had to postpone rolling their chocolate eggs due to our Easter Sunday fixture through in Kirkcaldy against Raith Rovers Ladies. Their efforts on the day meant that an end of game wee bite or two of chocolate would be in order as they put in a committed and impressive performance in their victory over their opponents from the Lang Toun. The initial stages saw both sides come to terms with the slippery conditions however it wasn’t long before Forfar’s pressing play saw them apply a consistent level of pressure on the Raith midfield and defence. This period of pressure resulted in a number of efforts being thwarted by a combination of good defending and goalkeeping from the Raith keeper. The pressure continued to build however and the deadlock was eventually broken when Eve Warden picked up the ball just outside the box before firing a low drive into the net. Forfar’s passing and pressing play was proving quite a handful for Raith and further goals were added to the away team’s tally with Steffi Simpson, Philippa McCallum, Kacey McCabe and Taylor Clifford all finding the net on at least one occasion. The girls from Raith Rovers found some joy playing down the hill in the second half and their lone striker showed great commitment to her team’s cause as she harassed the Forfar defence at every opportunity. On the day though Forfar proved to be a difficult outfit to control and their continued levels of pace and pressing play some them adding more goals to further increase their lead. 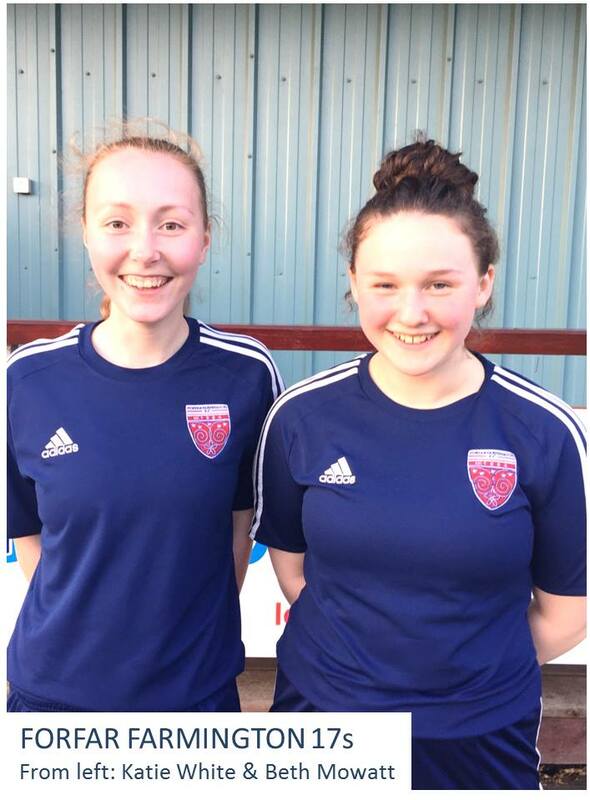 The second half Steffi Simpson and Taylor Clifford add to their goal count with Katie White, Melissa Coull, Erin Ross and Lucy Corbett, who scored her first goals for the 17s team, all adding to the goals for Forfar. Raith Rovers did manage to pull one back late in the game when a dangerous inswinging corner was flashed into the net by the head of their hard-working no.10 from midfield. Overall it was a very convincing victory on the day for the girls from Forfar. They didn’t allow their opponents any time or space to settle and at times their passing and movement was very impressive. We would like to thank all at Raith Rovers for their warm welcome on a cold day and we wish them all the best as their season moves forward.